Thanksgiving is one of my favorite holidays (actually I think it is my favorite). There is just something extra special about spending time catching up with family, playing games with the kids, and eating amazing food! This year we were lucky enough not to have to brave the roads with the boys. 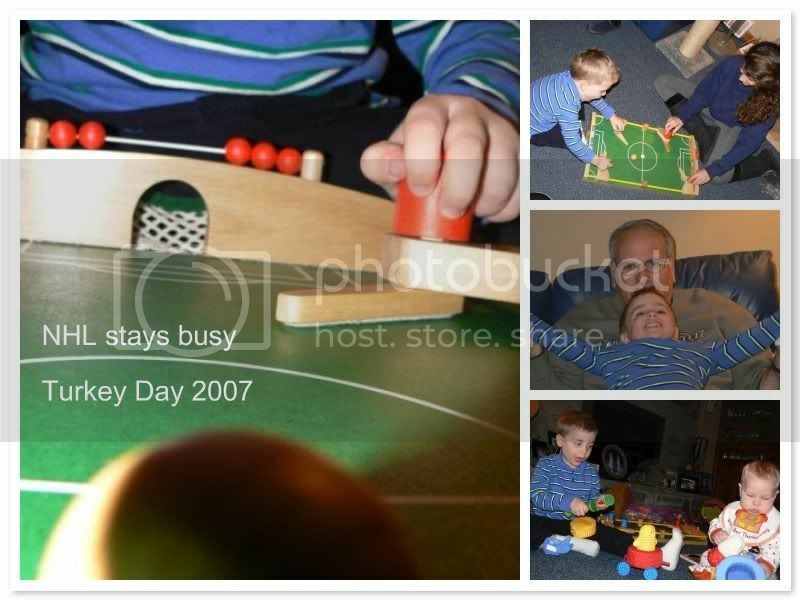 We stayed home and went to my Aunt S and Uncle M’s house. Their two kids (Cousin J and Cousin A) came home for the holiday. Cousin AC was also here to add to the fun, along with my parents and grandmother. In addition to this Uncle J, Aunt A, and Cousin Y all came into town. We were all surprised when we got there to see that Cousin Han was also in from Israel. I am not too sure when the last time I saw him, but it was wonderful seeing him (he is absolutely amazing with the kids – as is Cousin Y). One realization hit hard – my little cousins have all grown up. It is so hard for me to believe how my younger cousins are almost all adults. I know this should not seem as such a shock since I am now a mother with two children of her own. Ah, the memories are wonderful and hopefully there will be many more in the years ahead. Rather than bore everyone with what happened I am going to do it with lots of photos. 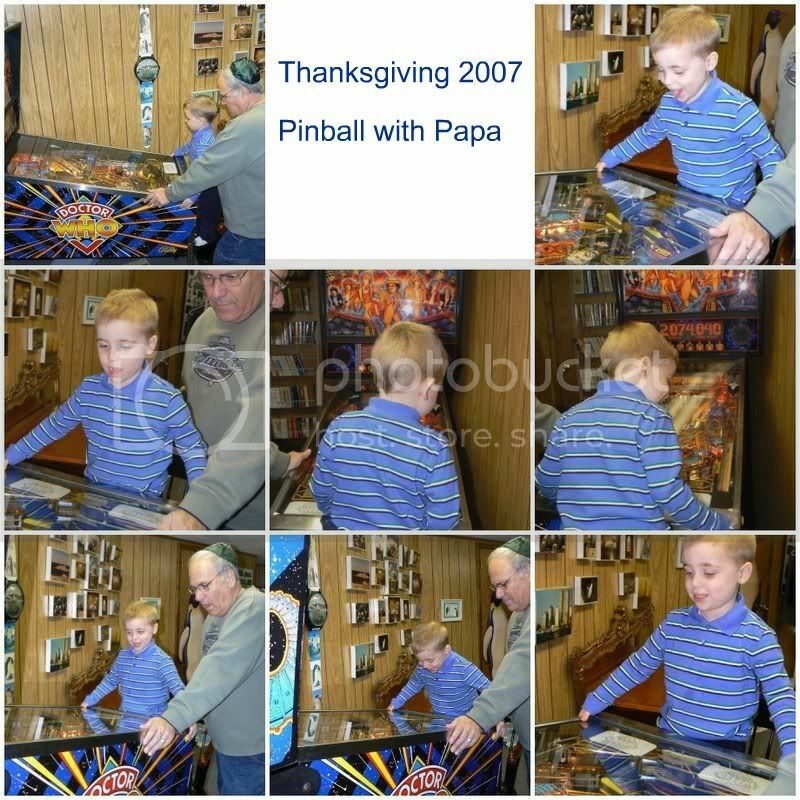 Here are photos of Thanksgiving. Both of the boys were spoiled with lots of amazing gifts from everyone. Cousin AC gave them fun books that we will read to them often. Uncle J and Aunt A picked out FUN toys and some Chanukah books. 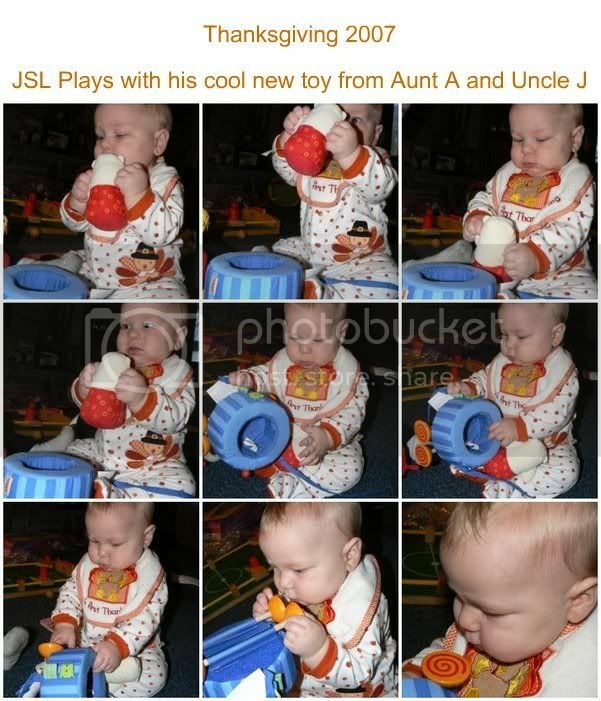 Here are photos of JSL playing with his gift (which NHL also loves) followed by NHL playing with his neat soccer game. Soon it was time to sit down for our amazing Thanksgiving feast. 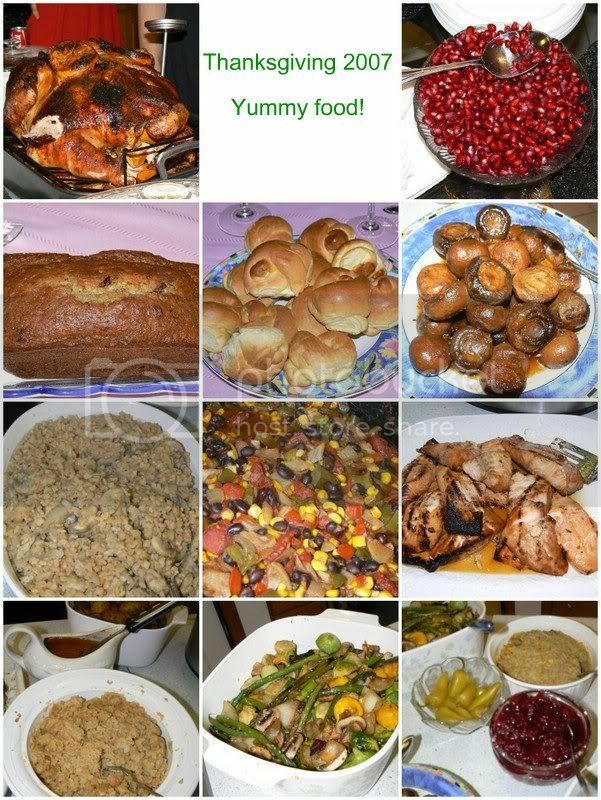 Here are photos of almost everything that was prepared by Aunt S (JL brought the pomegranate seeds and the zucchini with dried cranberry bread). After dinner while cleaning up there were a few funny moments. Check out this photo and tell me what is wrong. 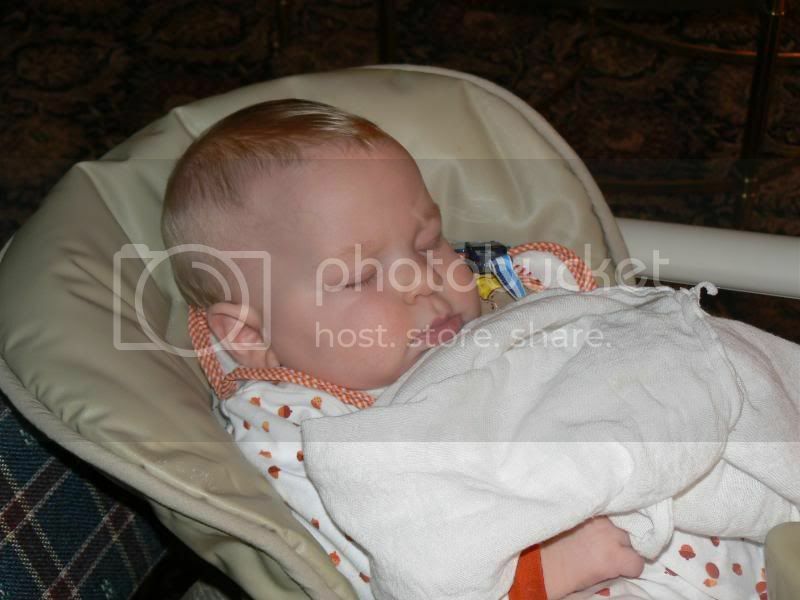 As previously seen JSL was exhausted from all of the excitement and even NHL fell asleep on the way home. 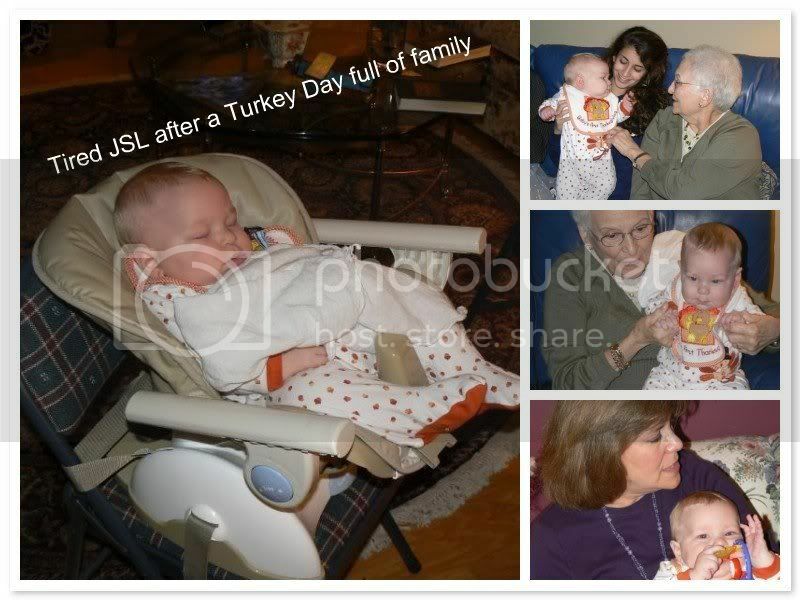 Here is one last shot of JSL’s 1st Thanksgiving as he was peaceful in his portable highchair at the table. Thanks to my entire family that was there for making it such a special day. 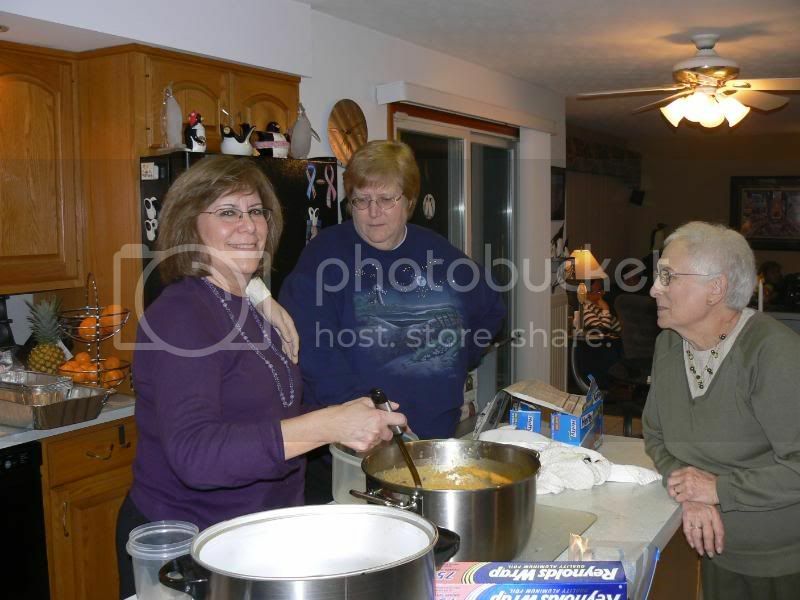 Aunt S, you are the best and I only hope that some day I will be able to pull off a holiday feast like you do. More photos of the weekend with everyone coming soon! All those family members made for a very cryptic post! And how many army reserves were you able to feed with all that food! holy moly! I see a hand on her shoulder? Whats up with that?? There were 14 of us eating (not counting JSL). We had just the right amount of food left to enjoy everything again for lunch Saturday after we had Shabbot services. lol – My aunt found a hand and apparently scared my grandmother with it. They posed for the photo and JL took it. I think it looks like someone is feeling her up. 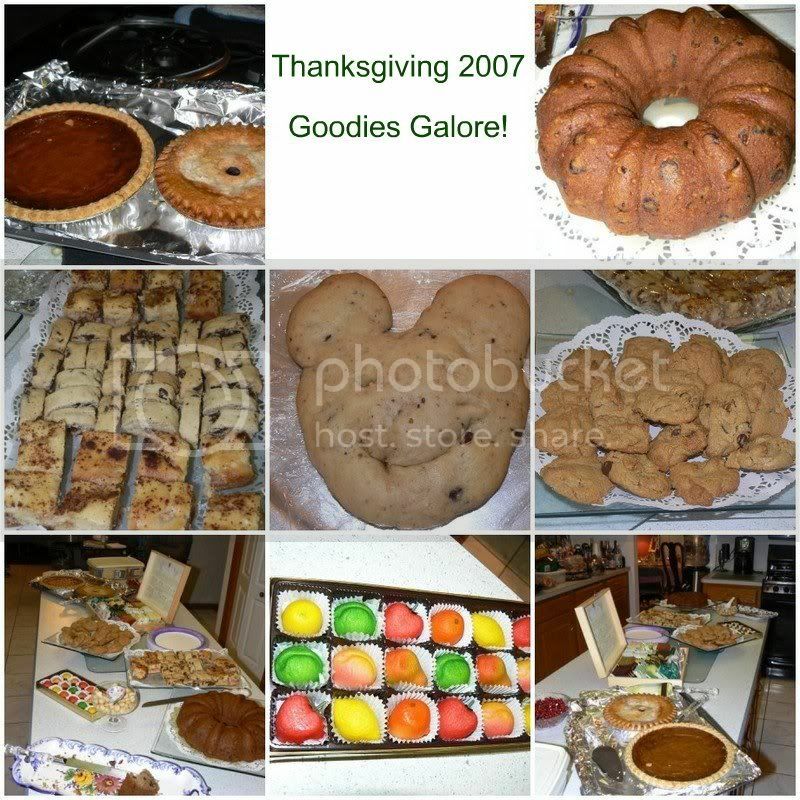 I thought I wouldn’t miss a traditional Thanksgiving dinner this year, and I didn’t until I saw your pictures–YUM! I guess it’s just the preparation and clean-up that I didn’t miss. The actual food . . .well, that’s a different story! Shawna: Sorry that looking at the food made you miss that aspect. It looks like you and your husband had a wonderful trip. Where did you end up eating on Turkey Day? I know you had a ton of options since there are SO many great restaurants and buffets there.